Home / Restaurant Equipment / Commercial Refrigeration / Undercounter and Worktop Refrigeration / Chef Bases / Beverage Air WTRCS36-1 Two-Drawer Refrigerated Chef Base, Drip Guard Edge, 36"
Beverage Air WTRCS36-1 Two-Drawer Refrigerated Chef Base, Drip Guard Edge, 36"
The Beverage Air WTRCS36-1 Two-Drawer Refrigerated Chef Base is constructed of a stainless steel exterior with an aluminum interior. Front grille is removable and allows for easy access to complete lift-out refrigeration system. The drawer frames are constructed of heavy duty 12 gauge stainless steel and are supported on 12 gauge telescoping drawer slides with 3 stainless steel roller bearing wheels per side for maximum support of stored food product. Its 16 gauge stainless steel reinforced marine top has a drip guard edge. Top drawer can accommodate (2) 12" x 20" x 6" deep pans, while the bottom drawer accommodates (2) 12" x 20" x 4" deep pans (not included). Its digital thermometer monitors interior temperature. 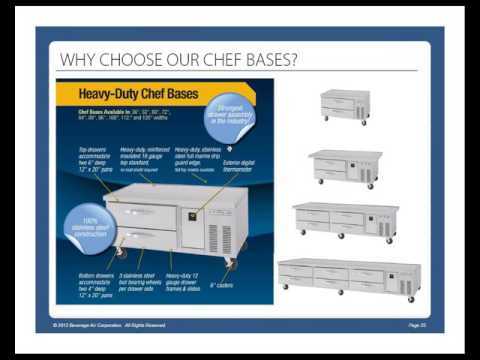 Chef base operates at 3638F for optimum food preservation. 8.5 cubic feet, environmentally friendly R134a refrigerant, side-mounted self-contained refrigeration, 6" casters, 1/5 HP, UL, cULus, NEMA 5-15P, MADE IN USA.